Marry Me is a simple and flexible wedding & celebration WordPress template for couples and their events. Well designed and equipped by beautiful effect, it is responsive and looks perfectly on retina displays. 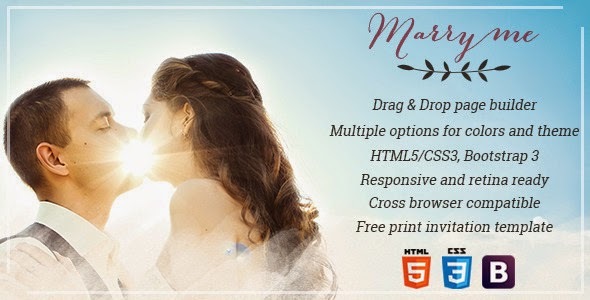 Marry Me is featured by CSS3/HTML5, fully supported social network, integrated Google web font, event management, guest book, RSVP and so much more. The back end is user friendly which is be easy to customize even for non professional developer. Demo content (pages, posts, layouts etc.) is included so that you can be up and running quickly. Full source plus individual PSDs for all sections and patterns included. Extensive online and offline documentation. All images in main PSD and Quickstart were generated from Shutterstock only to help you know exactly image size. Item Reviewed: New Elegant WordPress Wedding & Celebration Theme 9 out of 10 based on 10 ratings. 9 user reviews.